Nurses definitely deserve a reward once in a while. And if you’re looking for the perfect gift for your colleague or yourself, you’d want to pick something that’s nice and unique. We spent a lot of time looking for some really cool stuff with legit reviews. 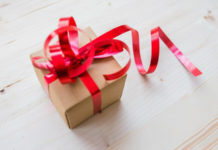 We also included some of our favorite go-to gifts for nurse friends. 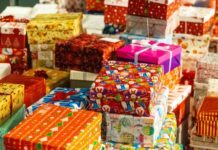 Here are some really cool gift for nurses you should totally include in your list. 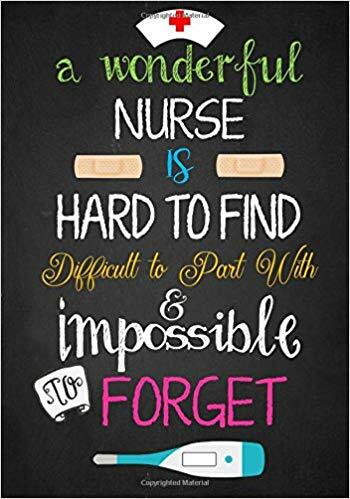 These cards make an awesome gift for both nursing students and nurses. You can easily include it in a gift basket, along with their favorite snacks or treats. On one side of the card, you’ll find bible-related verses and on the opposite, you’ll see generic motivational quotes. The cards are sturdy and have a really nice quality. 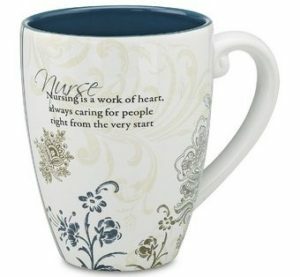 This nursing cup has a beautiful quote and a whimsical design. Able to carry 17 ounces of liquids, it’s a great mug for that much-needed shot of caffeine in the morning. 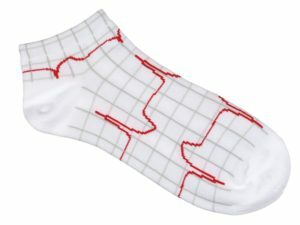 These socks with their heartbeat design are perfect for nurses. 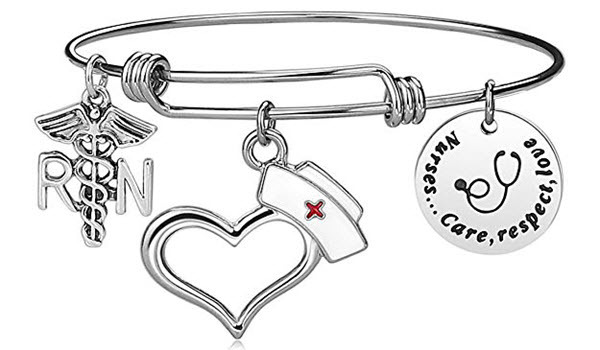 There aren’t too many nurse-themed gifts out there so you’ll want to grab these immediately. These heartbeat socks are made of 80% cotton, 15% nylon, and 5% spandex. They are designed for women but can fit a male giftee as long as your male nurse friend doesn’t have KingKong feet. Teddy bears as a rule are cute and irresistible. However, this particular bear is super special! She’s wearing a full scrubs uniform in pink and even sports a stethoscope and an ID badge around her neck. The fun doesn’t stop there either. This bear sings “I’ll Be There” when you press her paw. Her mouth opens and her body sways in time to the music. This singing bear is sure to cheer up a sick patient or a tired nurse. 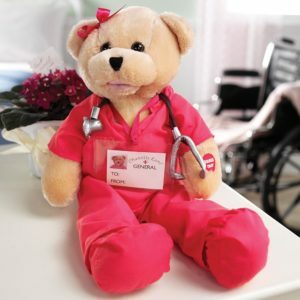 This bear nurse is 19 inches and comes with 3 AA batteries. Need a cute nurse bag? 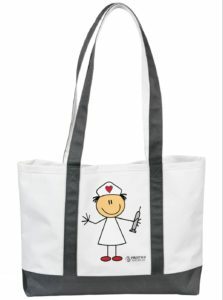 This Stick Nurse Tote Bag totally fits the bill. The straps are long for easy carrying. It’s a bit on the small side but will fit a folder and other nurse paraphernalia. It is waterproof and the cute nurse drawing is a clincher. It’s our favorite cute cat. Oh wait, she’s not a cat. Are you a Hello Kitty fan? If you are, then you should get these fun band-aids. They come with cute Hello Kitty prints and designs. 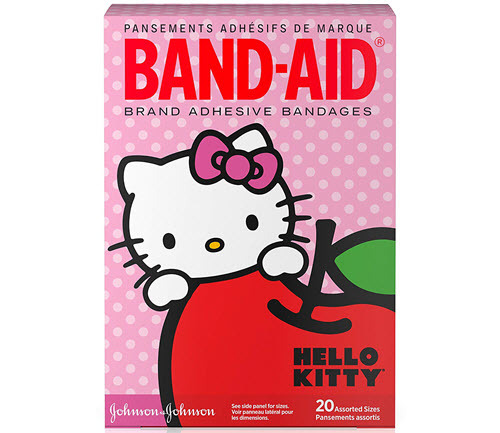 Full Disclosure: Some reviews mention that these band-aids don’t have the strongest adhesive so they are usually paired with regular band-aids and then the Hello Kitty ones are placed on top for the cuteness factor. 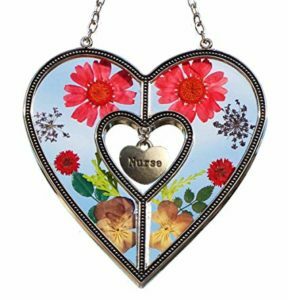 If you want a gift that’s beautiful and meaningful at the same time, get this nursing glass suncatcher. It’s a beautiful piece of work featuring real pressed flowers from China. It looks really pretty that anyone who sees it will surely stop to admire it. 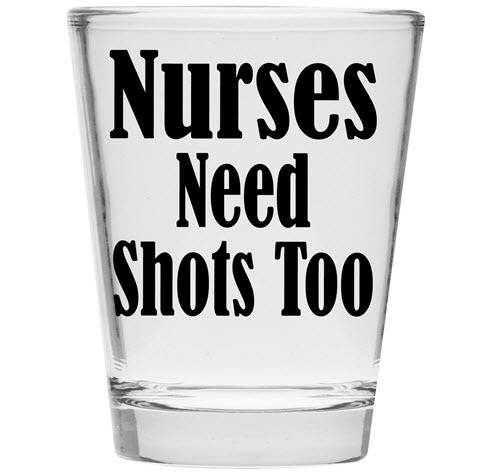 This one is definitely the perfect shot glass for nurses. Apart from its great print, it can also hold a full 2-ounce shot which is larger than others. Additionally, the shot glass is also dishwasher safe. This bracelet makes a fun gift. Made with stainless steel, it can resist deformation, rust, and fading. It’s less likely to cause allergies as well. It’s adjustable so you won’t have to worry about getting the right fit. Do you or your friend like charms? If yes, then check out this cute charm necklace. 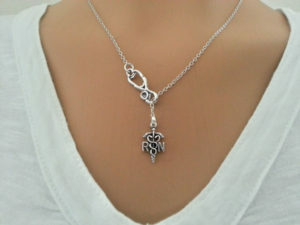 This necklace sports a Registered Nurse pendant and an equally cute silver stethoscope charm. It comes with an 18-inch silver plated chain. Here’s something for the home. This pretty nursing pillow will look great in your bedroom, living room, or even your car. It’s a great conversation piece too. 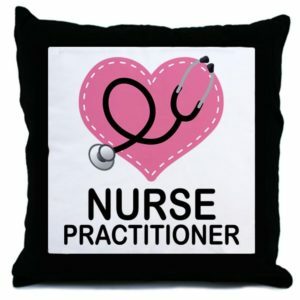 This nurse pillow is made of 100% brushed twill and canvass and ships with a pillow insert. 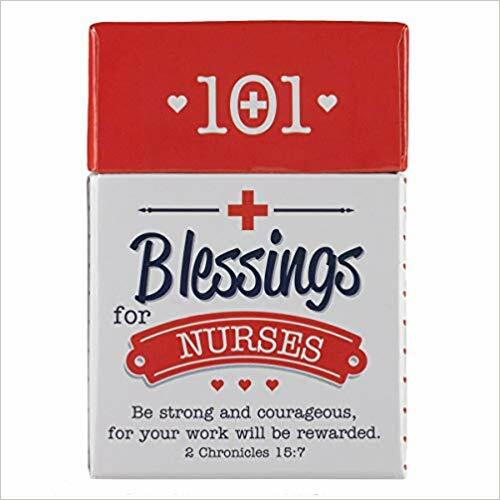 This nurse appreciation notebook gives you a fun and creative way of expressing your gratitude to your nurses. 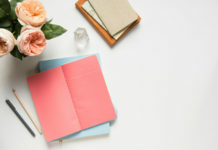 It comes with more than 50 double-sided sheets to give you enough pages to write your thoughts. 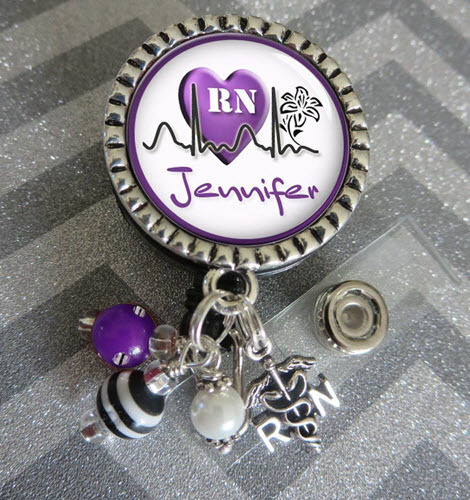 This is the perfect choice if you are looking for a nursing gift you can get customized. 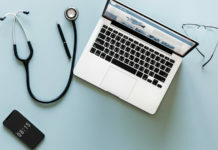 You can get it with your nurse’s name and credentials if you want. You also have the option to get it with a Caduceus charm or not. This is a cute printable sign you can use to decorate your wall or your notebooks. 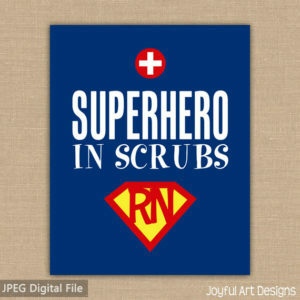 If your nurse friend loves Superman, this is a meaningful choice. Upon purchase, this particular product will be delivered to you as a high-resolution JPEG printable file. It can be printed at home or at any print shop, office supply store, or photo retailer. 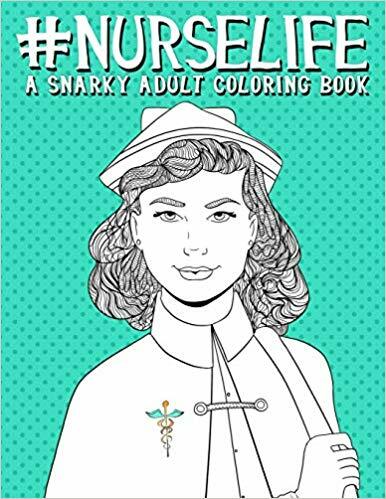 Art is one way to de-stress and this coloring book takes that to a whole new level. 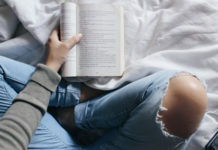 The book has really hilarious texts and quotes that can surely melt your stress away. The images are well-drawn and the paper’s quality is so good. This shirt is super comfortable to wear whether you’re at work or running errands outdoors. Made with 50% cotton, it’s designed to give a relaxed fit. This figurine is just an inspirational piece. 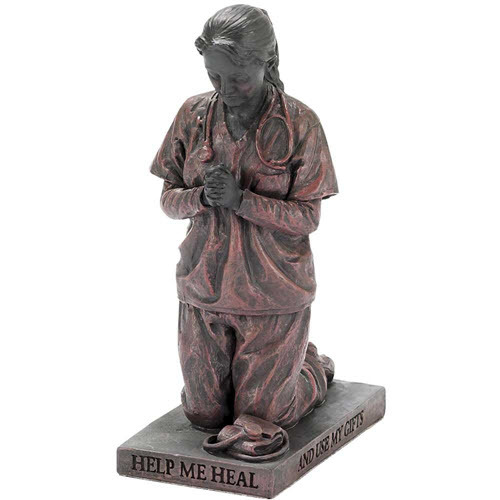 It will surely motivate any nurse to be gentle, caring, and patient at work. The figurine is nicely made. It doesn’t feel cheap nor extremely fragile. Nurse often forget to hydrate themselves, particularly when they are having a really busy shift. 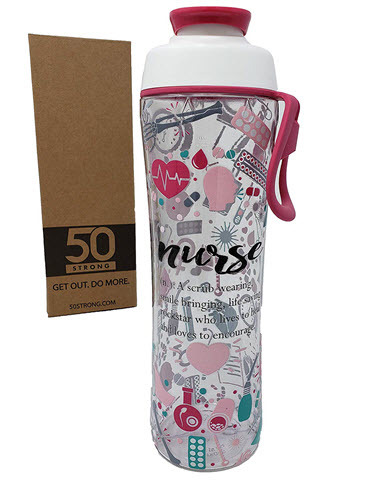 As a way to remind your nurse to always drink water, you can give her this eco-friendly water bottle. It’s made from 100% BPA-free plastic. 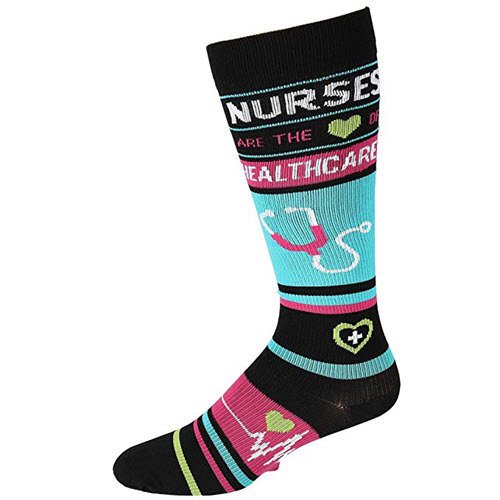 Apart from a good pair of shoes, nurses also need a good pair of socks. This one makes an excellent choice as it’s actually a pair of compression socks. It’s supposed to energize tired legs and reduce muscle strain. The socks can also help relieve varicose veins. 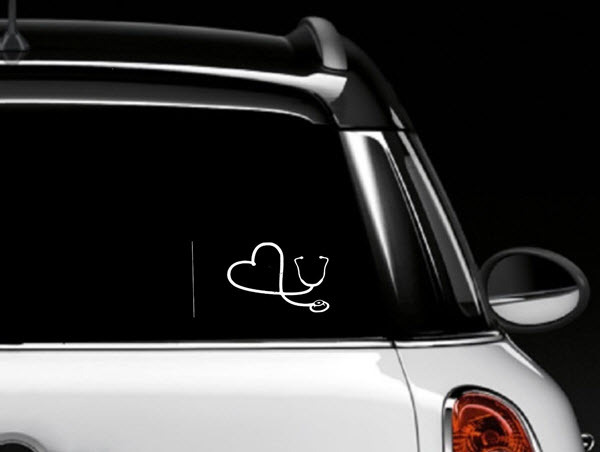 This car window decal is easy to apply and durable. It’s available in 11 different colors to match your vehicle. And the good thing is that you can actually use it on your computer, glass or any smooth sruface you want. 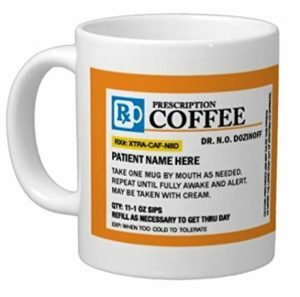 It’s Emergency Prescription Coffee! Just what every nurse needs. This is one of the best gifts for nurses on our list, particularly those who can’t function without caffeine. Your coffee mug will also surely become a conversation piece at work. Hilarious puns and phrases on both the mug and the coffee label such as: “Drink one cup by mouth, repeat until awake and alert” will keep you amused. 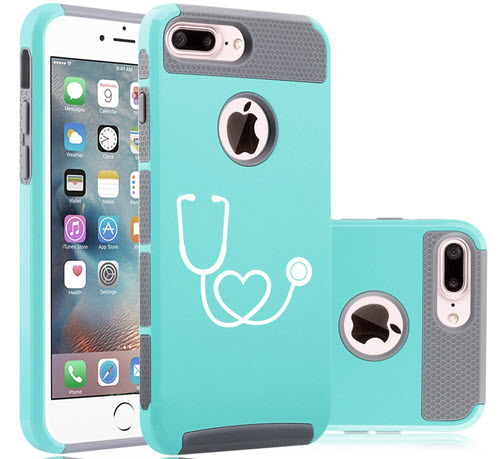 If you’re looking a little extra protection on your iPhone or just want to change designs then this cute, light blue stethoscope heart design case is a great choice. The case itself is rubber and is fitted for iPhone 8. 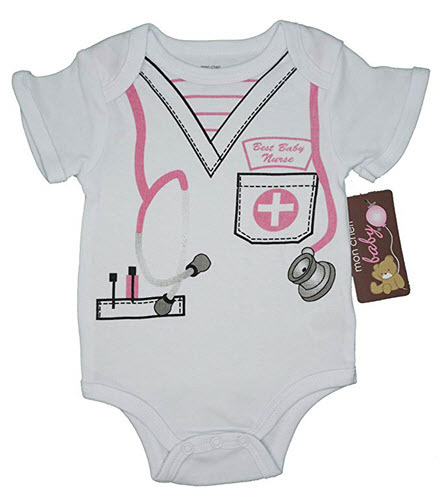 If one of your co-nurses is having a baby soon, then this infant bodysuit will make an excellent gift. It’s made with soft cotton which makes it less likely to irritate the baby’s skin. The design is just nice and adorable. 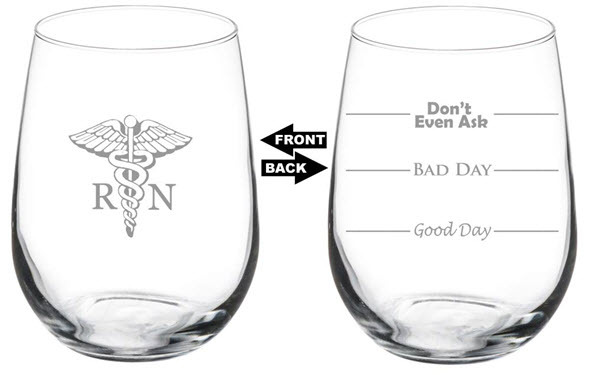 Nurses deserve a break and for those who find drinking wine relaxing, this stemless wine glass is for you. The etching is really clear and doesn’t fade easily. The glass is very well made. Anyone who receives this as a gift will surely be happy. 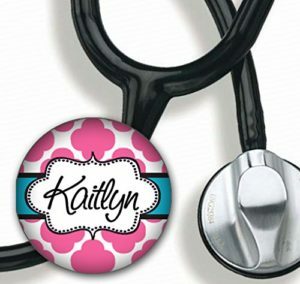 This is just what every nurse needs – a cute personalized tag. This personalized stethoscope tag is covered with mylar making it easy to clean and maintain. It’s also easy to attach on the stethoscope itself. 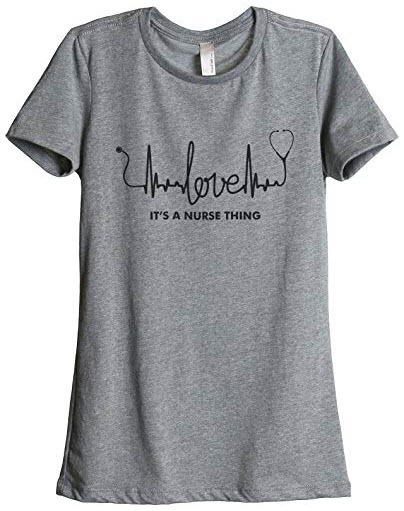 Did you like any of the 25 cutest gifts for nurses we featured? Which one did you like best? Did we miss other cute gifts we should be featuring? If yes, do reach out to us in Facebook. We’d love to hear from you! 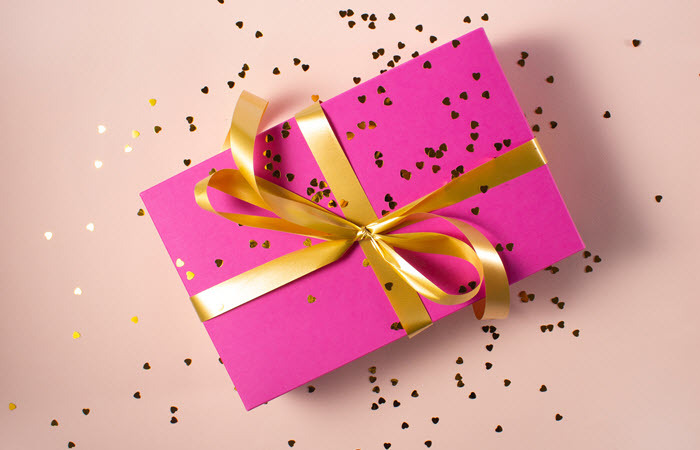 Good luck on finding that perfect and special gift for your friend!